In order to facilitate tshethar activities or the practice of freeing living beings from slaughter and death, the Ministry of Agriculture and Forests has developed guidelines for tshethar practices in the country. Providing the rationales behind the formulation and enforcement of the guidelines, agriculture minister, Lyonpo Yeshey Penjore said a number of issues are being faced due to Tshethar practice as animals were found to have been not regulated properly. “The unregulated practices lead to compromising the welfare of animals such as non-provision of adequate housing, care during transportation, health management during illness and general management of animals. Besides, the unregulated practices also lead to the introduction of exotic diseases in the country such as Highly Pathogenic Avian Influenza (HPAI) outbreak, Peste des petits ruminants (PPR) and Brucellosis,” said the agriculture minister. As per the guidelines, all the tshethar tshogpas are required to register as an NGO with the Civil Society Organization Authority (CSOA) prior to taking up any tshethar activities. “I have asked the Department of Livestock to enforce the guidelines as there are many tshethar tshogpas in the country but there are only handfuls that are legally registered with the CSOA which becomes challenging for us to monitor. Moreover, the transparency and accountability of such unregistered tshethar tshogpas cannot be traced as they cannot be audited,” said Lyonpo Yeshey Penjore. There is every possibility that through the noble package of tshethar practice, some of such unofficial associations might use the situation to their advantage and exploit people and animal altogether. Thus, it is the responsibility of the government to legalize all such activities in the country in order to promote transparency, said Lyonpo Yeshey Penjor. “Moreover, our country’s image is also at stake when it comes to tshethar practice by unauthorized groups whereby there have been instances where they have mobilized huge resources from international donors for tshethar practices— somehow projecting along the line as if the tiny Buddhist country is ridden with cruelty.” He also added that in the name of religion, there should not be any money making business taking place. In order to implement the guidelines by the Department of Livestock, MoAF, there has to be a legal entity, and in this case registering as a CSO ensures that. Lyonpo also added that there is a number of incidences of diseases spread within the country due to the tshethar practice. Therefore, he pointed out that the guideline will ensure that the welfare of the animals in terms of physiological, psychological, social, and environmental and behavior needs of the animals will be taken into consideration without fail henceforth. As of now, no new tshethar tshogpa has applied for the CSO status from the already registered three such organizations involved in rescuing and ensuring the welfare of the animals – which are Jangsa Animal Saving Trust, Bhutan Animal Rescue Centre, and Royal Society for Protection and Care of Animals. Lyonpo also gave an instance of deceptive practice concerning tshethar practice where the tshethar tshogpas colluded with the Yak owners and shared the dividends through illegal means. According to the traditional practices, yaks are slaughtered only after crossing certain age limits but the tshethar tshogpa and the yak owners rob the innocent people in the name of tshethar by maneuvering them to believe that the young yaks will be slaughtered if not for rescuers, explained lyonpo. The registered tshethar tshogpas with the CSOA can mobilize resources and rear the rescued animals to sustain themselves, provided that they comply with the terms and conditions laid out in the guidelines. Jangsa Animal Saving Trust – a registered tshethar tshogpa and prominent CSO in the country said that the Trust is in full support of the guidelines, the formulation of which was held in consultation with all the registered tshethar tshogpas. The Executive Director of the Trust, Tshering Dorji said that currently there are many uncertified tshethar associations in the country, which is a matter of grave concern. “Such uncertified groups pop out of nowhere and carry out tshethar practice for some time and unfortunately dissolves within few months or at the most after a year. 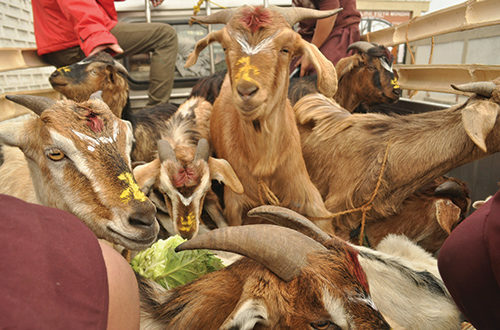 However, such existence of numerous unauthorized tshethar tshogpas has a long run implication on the legalized NGOs like ours whose primary objective is to provide lifetime security to the animals,” said Tshering Dorji. He added that the Trust is, therefore, grateful to the government for coming up with systematic guidelines that will not only ensure the welfare of the animals but also have pronounced mandates for dedicated NGOs like Janga Animal Saving Trust among others to function. Jangsa Animal Saving Trust today has a total of more than 4000 rescued animals in 11 animal shelters located across the country that are well equipped and in compliance with the guidelines for tshethar tshogpa. Dr. N. Dahal, Principal Livestock Health Officer said that there were also incidences where import of birds for tshethar tshogpa has led to bird flu outbreak in the past in Rinchending among many similar cases because of which having a guideline will ensure the welfare of domestic as well as the rescued animals in the country. “People think they doing by engaging in tshethar practices but in the absence of a clear guidelines or for that matter a legally registered entity, animal welfare is compromised,” he said. According to the guidelines, cattle, yak, Mithun, buffalo, goat, sheep, pig, poultry, fish among other animals can be considered for tshethar practice. Animals can originate from many places such as slaughterhouses, farms, villages, and towns but within the country and import of animals for the tshethar purpose is prohibited. Fines will be levied for non-compliance and the timely report has to submit to BAFRA by the tshogpa and the regulatory authority will, in turn, carry out periodic monitoring as well.